Ren Xingzhou led a team to Harbin from August 7 to 9. Ren Xingzhou, director-general of the Institute of Market Economy, led a team to Nanning from July 30 to August 2. 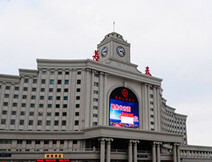 Fixed-asset investment in the country maintained steady growth in the first half of 2013.In the second half, investment in infrastructure and real estate are expected to stay stable, but estimates for growth are not high.